Wales is becoming a downright hostile place for the more than 80% of us who don’t speak the Welsh language. We are treated as second class citizens and it intensifies with every year that passes. In this article, I outline how Wales is run by, and for the benefit of, a small elite of Welsh-speaking middle class people known as the Crachach, and of how their power base has increased substantially over the last 50 years. We cannot afford to drive out our best and brightest graduates because they feel shut out of the jobs market on the basis they cannot speak Welsh. Wales is a small country with a small population of just three million people. In the public sector, the ability to speak Welsh is a requirement in an ever-increasing number of jobs. Our economy is grossly under-performing, with a lack of a skilled private sector. We need the best available people in the best jobs if we are to fulfil our potential as a country and as a people. The Welsh language is being dogmatically imposed on the people of Wales. It is used as a divisive weapon with which to alienate and ostracise vast swathes of the Welsh population, and as a means of promoting the worst kind of identity politics. The terms ‘Wales’ and ‘Welsh’ derive from Germanic root as a term used to describe the Gaulish people known to the Romans as Volcae, and which came to refer indiscriminately to all non-Germanic peoples. The Old English Anglo-Saxons used the term ‘Waelisc’ to refer to the Britons in particular. The Welsh language word ‘Cymru’ can be traced back to the seventh century and descended from the Brythonic word ‘combrogi’ meaning ‘fellow-countrymen’ and was used to describe the location of the post-Roman era (after the arrival of the Anglo-Saxons) of the Welsh (Brythonic-speaking) people of Wales as well as northern England and southern Scotland. It has the same origin as the words Cumbria, Cambria and Cumberland (a fact that sits uncomfortably with those who try to portray English people as ‘foreigners’). We should put our ‘Welsh’ identity into context and keep it firmly in perspective. When ‘Welsh Nationalists’ talk about ‘restoring’ Wales’s independence, what to they actually mean? Only once, for a brief period more than 1,000 years ago, was Wales an ‘independent nation’. That was between 1055 and 1063AD, when under the rule of Gruffydd ap Llewellyn. Aside from Grufydd ap Llewellyn’s eight-year reign, Wales has never been an independent ‘nation’, let alone one conquered by England (a narrative repeatedly pushed by Welsh nationalists). The terrain made it very difficult to govern (north-south transport links remain poor to this day), and internal rivalries made meant the term ‘Wales’ really refereed to a geographic entity rather than an independent nation. Wales’s history until the Industrial Revolution can be summed up as one of rivalling princes, each with their own territory, who would fight each other, and were willing to both fight against and co-operate with English sovereigns, depending on the circumstances. It is also important to keep a sense of perspective about just how small a population Wales had before the Industrial Revolution. In 1536, the population was around 278,000. By 1620, it had risen to 360,000. In other words, only 400 years ago, the population of the whole of Wales was about the same as that of modern-day Cardiff. The ‘start date’ of the Industrial Revolution is widely accepted to be 1760, and this, really, is where the story of modern-day Wales begins. It is one of waves of immigration who came to work in the coal mines, quarries and steel works over the following 200 years. By 1770, when the Industrial Revolution was gathering pace, the population of Wales had risen to 500,000, and by 1850 (ten years after the Industrial Revolution’s broadly-accepted ‘end point’) the population had rocketed to 1,163,000. In other words, the population of Wales more than trebled in an 80-year period, due to the need for workers in heavy industry. These new arrivals came predominantly from Devon, Herefordshire and Ireland, along with smaller influxes from other parts of England. They were English-speaking, and usually Nonconformist Christian. The population surge continued as the Welsh mining industry enjoyed its boom years, and by 1911 the population of Wales had more than doubled yet again to 2,421,000. As with before, these new arrivals were predominantly from Devon, Herefordshire and Ireland, along with a substantial number of arrivals from Italy, often from the town of Bardi. In the early 20th century, the area around the Cardiff Docklands experienced an influx from more than 50 countries, including Somalis, Yemenis, Greeks and Afro-Caribbeans, and it remains one of the oldest, most racially-diverse areas anywhere in the United Kingdom. This was followed by further waves of immigration across the South Wales area following the First and Second World Wars, and more in the years since, which continues to this day – there have been many arrivals from Poland since the early 2000s (though a smaller Polish community has existed in Cardiff for far longer). And that is the story of modern-day Wales, which, according to the 2011 Census, has a population of around 3,063,000 people. It is predominantly English-speaking, and has been for at least the last 150 years. The South Wales cities of Cardiff, Swansea and Newport: These are cities in a post-industrial era, with racially-diverse populations cosmopolitan in outlook. They are usually proud to be Welsh and British, but English is overwhelmingly the main language. One of the main challenges they face in the modern era is an over-reliance on the public sector for employment. There is a lack of an entrepreneurial culture and a skilled private sector when compared to other parts of the United Kingdom. The South Wales Valleys: Again, predominantly English speaking, but they are culturally very different to the cities. Still influenced by their Nonconformist Christian heritage, these are close-knit communities, and the people have a warmth and sincerity about them that is often lacking in the cities. Trip and fall in the street, or look lost, and people will go out of their way to help you. These areas have serious social and economic problems that came about following the decline of coal mining and heavy industry. They usually consider themselves both Welsh and British. Their problems are the same as those in the mining towns of Yorkshire and Nottinghamshire, and they are in many ways culturally similar. North East Wales: People in the area around Wrexham and Chester are proudly Welsh, the vast majority speak English as a first language, and have strong cultural and economic ties to Merseyside, Lancashire and Manchester. Historically, television aerials usually pointed to Granada and to this day, BBC Radio Two has TEN TIMES as many listeners as BBC Radio Wales in the area. the only areas where Plaid Cymru is represented in Parliament (they currently hold 4 of the 40 Welsh seats in Westminster). There is an internal divide in South West Wales, known as the Landsker Line, below which English has been the main language for centuries, following the Norse, Norman, Flemish and Saxon settlements. The Conservatives are strong enough to win seats ‘south of the line’. Of course, this analysis does not provide the full picture. There are cultural differences between Cardiff, Swansea and Newport, and I haven’t really addressed the status of the seaside resorts of North Wales. And there are differences between the east and west valleys in the south. But it gives a brief outline as to how terrain continues to influence the cultures (note plural) of Wales. And this, in itself, is one of the problems I have with Welsh nationalism. I consider it absurd that I, as a Cardiffian, should be expected to feel a greater kinship with somebody 190 miles away in Ynys Mon than I do with someone a 45 minute drive away in Bristol. The Industrial Revolution and the influx of immigration that followed was absolutely terrific news for enthusiasts of the Welsh language. The 1911 Census showed a record high of 977,000 people were able to speak Welsh. In other words, around one in four of the Industrial Revolution immigrant population to Wales and their immediate descendants had learnt Welsh, many of whom will have married Welsh partners. But an enormous increase in population in such a short space of time meant that Wales had been changed forever. The arrivals during the Industrial Revolution vastly outnumbered those whose family roots were in Wales beforehand, and therefore, English had surpassed Welsh as the main language of the Principality. By 1911, somewhere in the region of 617,000 of those who settled in Wales as a result of the Industrial Revolution and their descendants had learnt Welsh. That’s not far off twice the entire population of Wales pre-Industrial Revolution! So much for the Welsh Nationalist cliche that ‘the English’ were trying to oppress the Welsh language in the 19th and early 20th centuries! The 1901 Census showed 929,800 Welsh speakers, that was 49.9% of the population (though how many used it as their ‘main’ language is another matter – see below). By 1911, that figure had jumped to the aforementioned 977,000 people, which paradoxically was a reduction in the overall swollen population to 43.5%. These were boom times for the Welsh language, and it was to be its ‘high water mark’, but as this map from 1911 shows, even at that stage, English was by far and away the main language of Wales. By 1921, the figure had dropped to 922,000, or 37.1%. There are several potential reasons for this. One was the significant loss of young males in World War I. The other was that, in many instances (and quite possibly in my own family), parents deliberately spoke English rather than Welsh to their children as they felt that confident, fluent use of English would enhance their ability to ‘get on’ in life. The ‘Welsh Not’ and its influence is often somewhat overstated. The 1931 Census recorded a modest drop to around 909,000, but 20 years later, just 714,000 said they could speak Welsh. My father’s parents were young adults in 1951, and I don’t recall either of them being able to speak Welsh. I suspect the deaths of their parents’ generation was a large contributory factor, as was the increasing popularity of radio, which was mainly broadcast in English (more on that later). The decline of the Welsh language continued until it reached a record ‘low water mark’ of 500,000, or 18.5% of the population, in 1991. Ten years later, in 2001, that figure had reached 582,000, before dropping to 562,016, or 19% in 2011. The revival of the 1990s and 2000s ought to be taken with a pinch of salt for a variety of reasons. For example, the Welsh Language Act of 1993 saw the language being imposed upon schools across Wales, including in areas with no real history of Welsh speaking in living memory for even the oldest people. By the turn of the millennium, taking Welsh to GCSE level was compulsory. Yet those who’d passed the exam could presumably be counted as ‘Welsh speakers’ even if they barely remembered most of it a year or two later, and never intended using it again. Dodgy statistics and dogmatic imposition of the Welsh language have gradually become a hallmark of Welsh life. In some cases, saying ‘bore da’ to the postman means you count as a Welsh speaker. It seems highly likely that of the 19% of the population who can apparently speak Welsh, for many it is ‘pigeon Welsh’ and far fewer use it as a living language. Who is behind it, and what is their agenda? The term Crachach is used to describe the Welsh establishment. They are Welsh-speaking, middle class, nepotistic, usually have family ties to West and North West Wales, and are seen to hold many of the key positions in the Welsh media, arts, civil service and higher education. Not all Crachach can necessarily be described as ardent Welsh nationalists, quite a few are not immune to receiving gongs from the Queen, but they do not miss many opportunities to increase their power base, which increased substantially around the time of devolution in 1999. The journalist Carolyn Hitt wrote an amusing parody of the Crachach in 2006 (though she has become much more of an ‘establishment’ figure in Wales in the years since, and a steady stream of work at BBC Wales has followed). The late former First Minister of Wales, Rhodri Morgan, believed the Crachach to be very real, and upon the creation of the National Assembly for Wales in 1999, he called for ‘An Assembly of the people, not an Assembly of the Crachach’. Former Welsh Cabinet Minister Leighton Andrews also referred to the Crachach on a number of occasions during his time in the Assembly. He once said that higher education governance had become ‘the last resting place of the Crachach’. This article by Roger Dobson from the Independent in 1997, about how William Hague was marrying into a Crachach family, gives further depth as to the extent to which this unelected elite exerts influence over Wales, though it has increased substantially in the 22 years since the piece was written. The late Ian Skidmore, a witty writer and broadcaster who lived in Wales for much of his life, wrote this blog article in 2011. Scroll down to the piece that begins ‘Wales is a limited company run by a small group of families’ for a beginner’s guide to the grip the Crachach has on the media and arts in Wales. Ex-HTV Wales current affairs journalist Paddy French has carried out a number of detailed investigations on his Rebecca Television website into the influence this small group of families has in public life in Wales. “[The Crachach] maintains their control over Welsh cultural institutions with a jobs-for-the-boyos culture. Their sense of self-righteous entitlement in their attempts to preserve the language at the cost of the country’s rich English-speaking heritage have a negative effect – putting monoglot Welsh people off learning about the language. So how did the modern-day Crachach come about? Its origins can be traced back to a series of events that took place in the very early days of the BBC, and its effects can be felt to this day. Plaid Cymru co-founder Saunders Lewis perceived the early development of radio broadcasting in Wales to be a serious threat to the Welsh language, and as time went on he even went as far as to accuse the BBC of ‘seeking the destruction of the Welsh language’. At the same time he also recognised that if he could exert influence and pressure on the BBC, the Corporation could become a useful tool to serve Plaid Cymru’s political ends. BBC Director General John Reith described the Committee as ‘the most unpleasant and unreliable people with whom it has been my misfortune to deal’. Yet the Committee gained ever more influence on the BBC in Wales. Appointment of staff at BBC Wales was delegated to the Committee by the Corporation, and as newspapers of the time noted, appointees seemed primarily drawn from the families of the Welsh-speaking elite including “the son of a professor of Welsh and the offspring of three archdruids”. Lewis’s campaigning succeeded in cementing a strong Welsh nationalist influence at BBC Wales that continues to this day. The BBC’s Welsh Advisory Council was established in 1946, which included several Plaid Cymru supporters, one of whom was Lewis’s successor as Plaid Cymru president, Gwynfor Evans. And so the seeds were sewn. Aneirin Talfan Davies was one of the early Head of Programmes at BBC Wales. His son, Geraint Talfan Davies, was controller of BBC Wales for ten years from 1990. Geraint’s son, Rhodri Talfan Davies is the current director of BBC Wales, having been appointed at the age of 40 in 2011, despite having never made a TV or radio programme in Wales. Paddy French’s in-depth investigation on the matter can be read here. In the intervening years, the role was held by Menna Richards, a close friend of the Talfan Davies family. Since leaving BBC Wales, both Geraint Talfan Davies and Menna Richards have held a number of prominent directorships of Welsh companies and organisations, including, controversially, Welsh Water (though there is no suggestion BBC Wales has been influenced by these connections). Mr Talfan Davies was the head of the ‘Wales Stronger in Europe’ campaign in the lead-up to the 2016 referendum. A particularly absurd example came in mid-2018, when Rhuanedd Richards, a former Chief Executive of Plaid Cymru and special adviser to former party leader Ieuan Wyn Jones was appointed Editor of BBC Radio Cymru. The moral equivalent of this in England would see Alastair Campbell or Andy Coulson being appointed to the top job at BBC Radio 4. Yes, that sounds far-fetched, but the equivalent happens at BBC Wales. To put this incredible level of influence into perspective, Plaid Cymru only has around 8,000 members, which is an increase on the 6,000 they had before the autumn of 2018, when they experienced a spike which often happens when parties choose a new leader. But it is a minuscule number when compared to the 125,000 members of the SNP, its equivalent party in Scotland, or even compared to the 25,000 members of the Labour Party in Wales alone. “THERE is something sinister lurking in BBC Wales. It feeds off fear, does untold damage to the country and the notion of truth, drives many of our most talented people to leave and hides under the cloak of silence. The case of Radio Wales presenter Lionel Kellaway is something we should all take very seriously. After 15 years at the top of BBC Wales he was dumped. The reason – because BBC Wales is a racist organisation. That’s not just my view, it’s the view of many people there. And yesterday it became the official view of the Commission for Racial Equality. I have worked as presenter, journalist, and producer for BBC Wales. I could list many people, whose names you would recognise, who would agree with what I am writing. The Crachach culture is at the heart of everything that is wrong with BBC Wales, from the unreliable news coverage to the lousy quality of most of its ‘entertainment’ offerings. BBC Radio Wales recently ‘celebrated’ its 40th anniversary with the lowest listening figures in his history. By the 1960s, as the Welsh media scene developed, there was a gravitational pull of the Crachach away from the Welsh-speaking heartlands towards the west of Cardiff (most notably the district of Pontcanna) and Cowbridge in the Vale of Glamorgan. Indeed, the phrase ‘Pobl Pontcanna’ has become a colloquialism to describe the Welsh-speaking chattering classes. Prior to the 1979 general election, both the Conservative and Labour parties promised a Welsh language fourth television channel if elected to government. This was broadly welcomed by many non-Welsh speakers, because both BBC and HTV Wales showed Welsh language programming, which meant that programmes that the rest of the UK was watching in prime time were relegated in Wales to times when viewers were either in work or in bed. For this reason, many aerials in the South Wales area pointed towards the Mendip transmitter and, as has already been said, viewers in North East Wales pointed their aerials pointed towards the Granada transmitters, indeed Granada’s news programmes covered stories from North Wales until well into the 2000s. Those in East Wales often pointed their aerials towards ATV/Central’s transmitters, but for those in the Valleys, having popular programmes shifted to graveyard slots to accommodate Welsh language programming was a nuisance they had to put up with. Shortly after the Conservatives won the 1979 election, the new Home Secretary William Whitelaw backtracked on the plan. There was to be a new, UK-wide fourth channel, but, except for occasional opt-outs, the service in Wales was to be the same as for the rest of the UK. The following year, the then-President of Plaid Cymru, Gwynfor Evans, threatened to go on hunger strike unless the Government climbed down and created a Welsh-language TV channel. It should be pointed out that Evans had a long history of extreme, fanatical behaviour. The previous year, he was so distraught by the people of Wales’s decision to overwhelmingly vote against proposals to create a devolved assembly that he had to be talked out of committing suicide by friends on St David’s Day as a symbolic act of ‘national sacrifice’. But Evans got his way, and a Welsh language TV channel was to be created, ‘instead of’, rather than ‘as well as’ Channel 4 in Wales. Many people viewed the prospect of S4C as a mixed blessing. On the one hand, all Welsh language programming on BBC Wales and HTV Wales would be transferred to S4C, so viewers across Wales would be able to enjoy popular English language programmes at the same time as the rest of the UK. But on the other hand, S4C would was committed to broadcasting a near-entirely Welsh schedule during prime time, and for large portions of the daytime. Popular Channel 4 programmes such as Brookside were relegated to off-peak slots, while the flagship 7pm Channel 4 News programme was not shown on S4C at all. Inevitably, viewers in coastal areas continued to point their aerials at English transmitters so they could view the new Channel 4, and those in mid and west Wales and the valleys were forced to make do with late-night screenings of Channel 4’s most popular programmes. This situation continued until the 2000s, when digital switchover meant Channel 4 became available across Wales for the first time, at which point S4C became an entirely Welsh language channel. S4C used to receive an annual government grant of £100 million. Today, that figure is £80 million, most of which comes from the licence fee pot, with plans for all of it to come from this source by 2022/23. The big problem is that hardly anyone is watching S4C’s content, including the vast majority of Welsh speakers. On week ending 6 January 2019, the most-watched non-sporting programme on S4C had just 24,918 viewers! In a typical week, very few programmes get more than 30,000 viewers. Live rugby and football matches get substantially more, mainly because they are not available to view free-to-air anywhere else, rather than because they’re on S4C. In a good week, long-running soap opera Pobol y Cwm and farming show Cefn Gwlad might break the 30,000 barrier (both programmes pre-date the creation of S4C), but virtually nothing else does. Audience-gathering service BARB releases the highest-rating top 15 programmes each week. The programme in 15th place typically has around 18,000 viewers. That implies that the number watching their 20th, 30th and 40th most popular programmes each week must be minuscule. This is not a recent problem for S4C. Journalist and broadcaster Mike Flynn had a daily show on BBC Radio Wales from its launch in 1978 until 1989. As a non-Welsh speaking North Walian, he didn’t exactly fit in with the Crachach set or the culture of the Llandaff building. He points out that S4C’s viewing figures were pretty lousy even in the days of four-channel TV. He said: “It was always a jobs-for-the-boyos channel. There was lots of money being given to independent production companies run by veteran Welsh language campaigners from the 1970s who produced programmes that no-one watched. “Anyone who was connected got on the gravy train when S4C was launched. The ability to speak Welsh was a passport to public money. In 1978, just a few years before S4C came into being, Ysgol Gyfun Gymraeg Glantaf was set up a stone’s throw away from the BBC Wales building in Llandaff, to accommodate the children of the expanding Crachach community in the city. Mr Glyn, whose background was in children’s television and stand-up comedy, went on to take a job with the National Assembly until he was appointed station manager at city TV station Made in Cardiff in 2016, despite having no obvious qualifications for the role. Under his tenure, the station’s studio base has been sold off, and daily Cardiff-based output has been reduced to a news bulletin presented from the streets of Cardiff, filmed by a small team of student reporters and Glyn himself (despite having no formal journalistic training) on smartphones before being sent to the Made TV group’s Leeds headquarters for playout. Yet it has been made clear to me that being a Welsh-speaking Glantaf pupil is not in itself enough for you to ‘fit in’ at the Crachach set. At a friend’s wedding a few years ago, I was making conversation with a young woman who had begun her career in journalism before switching to PR. She was intelligent, attractive and charismatic, and has gone on to have a very successful career. I strongly suspect Wales has lost a potentially superb journalist and broadcaster, who could have been very popular with the public, but their loss is the PR industry’s gain. Two further developments that helped the Crachach consolidate their grip on public life in Wales occurred during the 1990s. The first was the expansion of the universities sector in the early part of the decade, which was a boon for Crachach seeking senior status in academic institutions. Then, in 1997 a referendum was held on creating a National Assembly for Wales. There was a 50.3% Yes vote, well within the margin of error, on a turnout of 50.22%. In other words, fewer than one in four of the people of Wales actually voted for the Assembly to be created. Between 1997 and 2011, the number of Assembly/Welsh Government civil servants trebled, and this led to a further swelling of the Crachach in western Cardiff, centred around the Pontcanna area, with younger, less affluent Crachach settling for nearby Grangetown. They are sizeable enough in number for Plaid Cymru to win seats on the local council in these areas, but they are nowhere near large enough to even come close to winning the Parliamentary seats of Cardiff West (where Pontcanna is) or Cardiff South and Penarth (in the case of Grangetown). The growth of the ‘Cardiff Crachach’ in the years since devolution was reflected in the results of the 2011 Census, which showed a decline in the number of Welsh speakers in West Wales but an increase in Cardiff. This is not a coincidence. The Crachach tentacles spread well into other spheres. In this short blog article, the former Liberal Democrat Assembly Member Peter Black outlines how the Crachach gravy train operates in the Welsh civil service. In literature, millions of pounds of taxpayers’ money goes to Welsh publishers, poets and authors for books on such bizarre subjects as ‘Independent Bus Operators in North Wales’ and ‘Welsh Airfields’. A Welsh writer can obtain up to £10,000 to stay at home and write a book, regardless of whether it is published or not. However, such grants do not go to young, up-and-coming writers, or to nurture new talent. They go to BBC Wales staffers, Welsh establishment figures and ‘celebrities’. For example, Geraint Talfan Davies’s autobiography, ‘At Arm’s Length’ was subsidised by a Welsh Books Council grant to Seren Books. According to Nielsen Book Data, it sold 179 copies in four years! Gwyneth Lewis, the ex-national poet of Wales, wrote a piece in the Guardian defending these subsidies, but was too shy to mention that she received £11,000 from the taxpayer for her work. The BBC Wales entertainer Owen Money received £6,000 from the WBC to write his autobiography, ‘Money Talks’, and another BBC Wales presenter, Mal Pope, was given £4,000 by the WBC to write his memoirs, ‘Old Enough to Know Better’. In the five years to 2013, the WBC received £39m of taxpayers’ money, with another £3.85m going to Literature Wales. In 2012 alone, the Welsh Books Council received £7.6m of taxpayers’ money. It distributed £1,853,500 towards the publishing of Welsh language books, including £365,272 which went directly to authors. Another £751,465 was spent on English language books by authors living in Wales. Meanwhile Literature Wales spent £703,000 promoting Welsh literature through festivals, roadshows, grants and ‘services to writers’. Authors who are part of the ‘in crowd’ do not even have to produce a book to receive a grant, they only have to show that they intend to write one. By contrast, in England, people who are given arts grants have to give up their time to teach two days a week. In an age where absolutely anybody can publish an e-book for very little money, or self-publish for only slightly more, how on earth can such grants to Welsh establishment figures be justified? The National Eisteddfod takes place during the first week of August each year. It is treated with a deep reverence by a section of the Welsh speaking community, most notably the Crachach set. They take it very seriously indeed. When watching the proceedings in the main hall (known as ‘the maes’), one could be forgiven for thinking we are witnessing an ancient religious-like ceremony steeped in tradition. It is right and proper to the great faiths of the world with respect – if you are in a church, mosque, synagogue or temple, it is quite correct to follow the protocols and to behave appropriately when you are in their buildings. But the Eisteddfod and the Gorsedd of the Bards does not come from some ancient tradition. In reality, the Gorsedd was created in the 1790s by Iolo Morganwg (actual name Edward Williams), an opium addict and scholar who forged a number of his claimed manuscripts. The first Gorsedd of the Bards was formed in 1792 in, erm, Primrose Hill, London. Members of the Gorsedd wear robes depending on their area of contribution (until just a few years ago the colours represented rank), and they’re dressed in green, blue or white robes. The initiation ceremony, appears to involve them kneeling and a sword being pulled from its scabbard behind them, then put back in again, with a horn of some sort playing a part. To me, and to those of us who aren’t part of the Eisteddfod set, it all looks very strange indeed. The Eisteddfod portrays a Welsh Nationalist’s image of Wales and what it is to be Welsh. It attracts around 150,000 people on a good year (though many of those will be the same people returning day after day) with below 60,000 watching the wall-to-wall coverage on S4C. In other words, it very clearly does not connect in any meaningful way with the vast majority of the population of Wales. I am well aware that many Welsh speakers won’t have anything to do with the Eisteddfod, believing it to be cliquey, full of factions, snobbery, and rivalries. Accusations of bias in the judging of competitions is never far away. I have taken the expletives out of what he told me because, well, this blog is ‘family friendly’. You can be an ‘outsider’ at the Eisteddfod for speaking the ‘wrong kind of Welsh’. Apparently ‘Carmarthen Welsh’ is the required dialect to fit in. The overly-serious nature was epitomised by what would by normal standards have been a very minor incident witnessed by somebody close to me who took part in the 2010 Eisteddfod in Ebbw Vale. Heavy rain caused the ground to be waterlogged, and following the conclusion of the afternoon’s events, somebody took to the stage and announced, in English, that shuttle buses would be available to take spectators to the main car park. There was a huge gasp in the audience, as though the announcer had said something completely outrageous. In reality, their terrible crime had been to make a safety announcement IN ENGLISH from the stage. These people really do get worked up about such trivialities. During the 2018 Eisteddfod, I tried very hard to watch a few hours of the coverage one afternoon and despite 12 years having passed since that article was written, I found it difficult to argue with that definition. The site was just a short walk away from Butetown, one of the oldest and most racially-diverse communities anywhere in the UK, yet I didn’t see a single non-white face in the Wales Millennium Centre main hall or in the surrounding area outside throughout. This screenshot demonstrates that there were empty seats and a disproportionate number of those in attendance were elderly. It doesn’t feel like a festival that celebrates all that is good about Wales – English speakers, Welsh speakers, different racial backgrounds, many faiths and so on. I don’t want to spoil anybody else’s enjoyment, and if a pseudo-pagan fancy dress party floats your boat, by all means carry on. But if there is to be a festival so narrow in scope, why should the public purse should be expected to subsidise it? I do not demand that the taxpayer subsidises my tastes in entertainment. Last November, it was announced that the 2018 Eisteddfod in Cardiff Bay made a record loss of £290,000. This was spun by organisers as an ‘investment in the Welsh language’, a claim that went unchallenged by the sympathetic reporters at BBC Wales and elsewhere. A record 500,000 people attended the free event in Cardiff Bay (there is normally an entrance fee), but as usual, these figures should be taken with a pinch of salt. How many of these people were returning day after day? How many of them were tourists who happened to be in the area and drifted onto the ‘maes’? How many of them were people enjoying the bars and restaurants of Cardiff Bay and walked across for a brief glace? Unless there were huge queues to sign up for Welsh language classes as a result of it, any claims that it was an ‘investment in the Welsh language’ should be treated with deep suspicion. The organisers and the Welsh establishment are the ones making the claim. It us therefore up to them to prove it. I live in the area, and spent much of the week working in the centre of Cardiff, just a mile or so up the road from the ‘maes’. The talk in the shop queues and cafes was about the new football season starting (Cardiff City had just been promoted to the Premier League), holiday plans, Brexit and so on. I didn’t hear people discussing the Eisteddfod taking place in close proximity even once. To English-speaking Cardiff, it was considered largely an irrelevance. The Eisteddfod promotes a parochial, insular image of Wales, that is not shared by most people in the country. Many of us who are proudly Welsh like to think of Welsh culture in different ways – our industrial and mining heritage, music – from classical, to Tom Jones to the Manic Street Preachers, various sporting achievements, Brains beer, Welsh cakes, a night on the town, our spectacular coast and countryside. To put some ‘intellectual meat’ on the bone, we think of the art of Augustus John, acting giants such as Richard Burton, Rachel Roberts (nominated for an Academy Award for This Sporting Life), and Sir Stanley Baker (arguably a greater actor than Burton). We think of novelists such as Gwyn Thomas (who is often rightly described as ‘the true voice of the English-speaking valleys’), John Morgan (who helped set up HTV) and the still very much alive Mavis Nicholson, probably TV’s greatest interviewer, who has been disgracefully under-appreciated since the mid-1990s. There’s Ian Skidmore, born in England, whose journalism, radio work and in later life blogging brought the best of Welsh wit, intellect, humour and warmth to the world for half a century. In heavyweight journalism, we think of John Humphrys, a working class, English-speaking boy from the Splott area of Cardiff who passed his 11 Plus, got into Cardiff High (then a grammar school) but left aged 14 because he didn’t fit in with the middle class atmosphere of the place. He worked on local papers in the South Wales area where he quickly gained a bit of a reputation, then went into TV at TWW (the ITV contractor in Wales pre-1968) before joining the BBC, where at his peak he was one of the very best political interviewers the UK has ever known. Indeed, Mr Humphrys has, on occasion, been a vocal critic of the Welsh Crachach establishment. Alan Watkins was a brilliant political commentator and raconteur during the second half of the 20th century and early 21st century, as well as being a witty rugby writer. There’s Jan Morris, one of the great historians and travel writers of this or any other era, perhaps best known for her Pax Britannica trilogy, and continues to produce interesting and thoughtful work at the age of 92. In high-brow music, there was Sir Geraint Evans and Dame Margaret Price, as well as the versatile Sir Harry Secombe, who was a first-rate singer, actor and TV presenter. He also had that very rare ability to be a master of comedy and of more serious roles, both in character and as his real self. Dame Shirley Bassey is perhaps the best example of a performer who epitomises 20th and 21st Century Wales at its most rich and diverse. She was born in Bute St, Butetown, to a Nigerian father and a mother from Teeside, and grew up in unglamorous surroundings in the aforementioned Splott. Her powerful voice was discovered at a young age, and her career has seen her remain one of the world’s most popular female artists for six decades and counting. These are all incredible people with extraordinary life stories. All of them inspire me in their different ways, and all have earned the respect and admiration of people in the United Kingdom and throughout the world. I’m aware that Richard Burton flirted with Welsh nationalism (though never very seriously) has an Eisteddfod award named after him (though I can find no evidence that he ever had anything to do with it), but beyond that, all of these people represented the best of Wales both to the United Kingdom and the wider world without having anything to do with the Eisteddfod, and, to my knowledge, without the huge subsidies that the Crachach cliques grant to their favoured performers (nearly always from Welsh language backgrounds and with far more Welsh-sounding names than nearly all of the above mentioned). It seems likely to me that all of the above would be appalled at how provincial Wales has become, where the all-powerful Crachach hand out jobs, grants and privileges to the favoured few at the expense of the non-Welsh speaking majority. A pertinent example of how exclusive and cliquey the National Eisteddfod is came in the summer of 2016. Less than a month beforehand, the Wales football team reached the semi-finals of Euro 2016, their greatest ever run in a major competition. I have never known anything that brought Wales together to this extent. It came just weeks after the Brexit referendum, in which the majority of participants in Wales voted Leave, following much the same pattern as England. The UK was divided and ill at ease to itself. But in Wales, for that brief few weeks, it seemed as though the whole country, north and south, united behind Chris Coleman’s men as they exceeded expectations. The open top bus parade that greeted them when they returned home was something I shall never forget. In the weeks that followed, there were accolades, TV appearances and celebratory dinners. This was a great time to be Welsh. Everyone wanted to be a part of it and heap praise and honours on the team. Everyone, that is, except the National Eisteddfod. Charming. Three members of the team, Aaron Ramsey, Ben Davies and Joe Allen are known Welsh speakers, which is more than proportionate to the overall percentage of the population who speak the language. I do not wish to associate with an event that is so snobbish and discriminatory. It does not represent Wales or most people who live here. It is a Welsh Nationalists/Welsh language image of Wales, to which most of the population do not subscribe. Indeed, Plaid Cymru itself was founded during a meeting at the 1925 Eisteddfod in Pwllheli. The party’s co-founder, the aforementioned Saunders Lewis, was an ardent Monarchist and devout Roman Catholic. He didn’t care much for political independence, even going so far as to say that Wales was a nation (as in a people with a culture and, most importantly for him, a language). His ultimate vision was of a Welsh-speaking, monoglot Wales of small-scale farmers as part of a united Catholic Europe. Lewis was far from universally popular among the Welsh nationalist movement. A significant number were suspicious of his conversion from Nonconformism to Roman Catholicism. He was pretentious and snobbish, with a reedy voice, cerebral style and aristocratic contempt for the proletariat. Many Welsh language literary critics don’t hold his extensive writings in high regard. But there was a far darker side to Lewis, ones which modern-day Plaid Cymru prefers not to talk about. Lewis’s writing is littered with numerous grotesque examples of anti-Semitism. A repeated phrase of his is ‘Hebrew Snouts’, which he uses when referring to Jewish financiers, with Alfred Mond being a favourite target of his. Lewis had an affection for the politics of Franco, Salazar and Petain. Plaid Cymru officially remained neutral during World War II. Some senior figures openly advocated that a German victory would be better for Wales. Lewis’s anti-Semitism and support for fascism became a target for opponents of the party and an embarrassment to some of its supporters, including the writer Ambrose Bebb (the grandfather of current Conservative MP Guto Bebb). Plaid Cymru’s stance did not stem from Christian pacifism but from their own nationalist opposition to Britain, which they saw as a greater threat to Wales than Hitler. In the late 1930s, the party’s internal newspaper cited Jewish influence over the British media as a source of the drive to war. So, there we have it. Hitler and Mussolini were friends of the nationalists, but English children escaping the ravages of war were the enemy. Plaid Cymru doesn’t like to mention or discuss, let alone condemn its own murky past. Indeed, former party President, Lord Dafydd Wigley, who will have known Lewis personally, called for the ‘character assassination’ of him to end during a 2015 interview, as though Lewis’s abhorrent views were some kind of minor character flaw. Yet there are far more recent examples of similar sentiments coming from senior figures in the party. In 2001, Gwilyn ab Ioan, then-Vice President of the party, was reported to the Commission for Racial Equality by Ian Skidmore for saying that Wales was becoming a dumping ground for England’s “oddballs, social misfits and drop-outs” and that that Wales was being overrun by an “alien culture” which was making it “a land full of foreigners”. During the same interview, Mr Glyn said that English incomers should be ‘made’ to learn Welsh. During the last decade, it has become clear that such attitudes are not confined to Plaid Cymru. Huw Thomas, the leader of Labour-controlled Cardiff Council, grew up in Ceredigion (once known as Cardiganshire) where, as a student, he advocated the vandalism of cars belonging to English people in Wales and called for incomers from England to be forced to pay additional income tax if they fail to learn Welsh within a year of their arrival. In 2006, Thomas wrote a blog posting in which he expressed his dislike of people who displayed their support for the England football team. He wrote: “I agree that it’s completely sickening how many England flags are to be seen around Wales. It truly shows the degree our society has been infiltrated by incomers who are not ready to integrate. “Very often, from what I see, some flying English flags are young people, who have been brought up in Wales, but who are loyal to England. This raises questions about us as Welsh people as well. “It’s true that the parents are at fault, but it’s obvious that the education system has failed to create a Welsh Nationalism in these people, and I wonder also how many of us Welsh people, in our school days, tried to bring these people (aka chavs) into the Welsh circle. “I can’t speak with a clear conscience by a long shot, so don’t think that I’m preaching, but it’s something to consider I feel. “The retail sector is also responsible for making the situation worse I think, and all across Britain not only in Wales. The World Cup, to a large extent, is just an opportunity for high street shops to ‘cash in’, using special offers and social pressure to create a fake group mentality – Nationalism Asda style! Thomas has expressed his regret over these comments, and says they are no longer his views, but his actions as leader of Cardiff Council suggest he still has a lot of enthusiasm for forced Welsh language imposition. The story of the last 40 years in Wales is one of a group of small, but vocal Welsh language campaigners demanding more and more, and being given exactly what they want, regardless of cost or benefit to wider society. It began with road signs in English-speaking parts of Wales being produced in both English and Welsh after a stupid and dangerous campaign by Welsh language campaigners of painting over English-only road signs. This was followed by Gwynfor Evans threatening to starve himself to death unless S4C was created in 1982. This was followed by the Welsh Language Act of 1993, which led to a massive increase in the use of Welsh in the public sector, regardless of demand. This was followed by the creation of the National Assembly for Wales in 1999, which fewer than one in four of the people of Wales actually voted for. This was followed by another Welsh Language Act in 2011. In that same year, the Assembly’s powers were increased, which fewer than one in five of the people of Wales actually voted for in a referendum. To bring the story up to date, since 2016 there has been a policy of ‘Welsh first’ road signs being gradually rolled out, regardless of the fact that in many cases these are in an area where only a tiny minority actually speak Welsh. There was little to no public consultation or debate about this. It was imposed upon the people of Wales by the Welsh Government, or more specifically, the Welsh civil service, where the Crachach classes pull all the strings. It appears that Welsh language imposition is now taking priority over road safety. When people are travelling at high speed, the purpose of road signs is to convey information as quickly and as succinctly as possible. Putting signs in a language only a small minority speaks over a language pretty much everybody speaks compromises safety. Indeed, I have heard a number of anecdotes of electronic motorway signs being only in Welsh, or switching between Welsh and English periodically, by which time the car has passed the sign. Was it telling us to slow down? Was it telling us there was an accident ahead? Or was it wishing us a Merry Christmas? When rain is lashing down on your windscreen, and there is heavy traffic on the motorway, the purpose of electronic motorway signs is to convey messages to keep drivers safe, and that means using a language close to all drivers understand. Road signs are an important example of how public money is being wasted, and safety compromised, to appease the Crachach and Welsh language campaigners. But in day-to-day life in Wales, we see many subtle, more trivial signs that non-Welsh speakers are now to be considered second class citizens. For example, I have been attending Cardiff City matches, on and off, since I was eight years old. During my childhood, the stadium public address announcements were made in English, and English only. For many years, the announcer was the late, great Phil Suarez, who also commentated on matches for local commercial radio. There were periods when the announcements were made by other English language radio personalities including Steve Johnson and Darren Daley. There was no controversy whatsoever about English-only announcements at the time. The club was in the lower divisions, crowds were rarely much above 2,000, the overwhelming majority of whom were non-Welsh speakers from Cardiff and the South Wales Valleys. In the early 2000s, the excitable Ali Yassine was appointed as stadium announcer. Yassine, from the city’s Somali community, learnt the Welsh language in his 20s, and would use a small amount of Welsh during his announcements. Shortly before the start of the 2015/16 season, Yassine was relieved of his duties, and as a temporary measure, author, club historian and veteran former radio commentator Richard Shepherd took over announcing duties. Shepherd announced in English only. The following January, the club pledged to reinstate Welsh language announcements following an online petition signed by fewer than 300 people. To put this into perspective, at that time, the club was typically attracting crowds of around 24,000. So in other words, below 1.25% bothered to sign the petition. But hang on…..there was no way of verifying that those who signed the petition actually attended matches. Many of the signatories could easily have been Welsh language activists who spread the word via social media. Some (many?) could either have had no interest in the club at all, or had been living hundreds of miles away in Porthmadog. Even if we are to give the benefit of the doubt and assume that every single signatory was a dedicated season ticket holder, the club changed its policy to appease a minuscule number of its supporters. Welsh football international home matches are nearly always staged in one of the two stadiums of Cardiff. During most of the 2000s, into the 2010s, stadium announcements were made by Yassine, who behaved in much the same way he did a Cardiff City games. At some point around early 2018, Rhydian Bowen Phillips became the stadium announcer. Bowen Phillips is a Welsh language entertainer, as well as a militant Welsh nationalist with an enormous tattoo on his arm of his hero, the fourteenth century prince, Owain Glyndwr. Phillips is a Conservative Party-hating, Thatcher-loathing, pro-EU republican who never misses an opportunity to voice his ‘Welsh not British’ credentials. Upon taking on Tannoy duties at Wales games, Bowen Phillips took to announcing in Welsh first, and English second. Did he bother to ask the permission of his employers at the Football Association of Wales before doing this? Or did he just decide to do it and see if the FAW would dare to challenge him, in which case he would likely kick up a fuss? If the FAW did give him permission, why did they do so? The vast majority of fans who have paid good money for a ticket have come from English-speaking communities, and they deserve to have their main language given preference when attending matches. Bowen Phillips is entitled to his opinions in his personal life (however distasteful one may find them), but it is not acceptable to impose these values on his workplace, or on thousands of people who have paid to watch a football match. Welsh language announcements in football stadiums may seem like a minor matter in the grand scheme of things, but they are symptomatic of what is happening in an ever-increasing number of areas, some very important, others trivial. For example, during 2018, Transport for Wales became the new rail operator in Wales, and their livery began to appear on trains and at stations. Station signs appear in Welsh first, in thick black, and English underneath, in faint grey. It’s yet another subtle sign to the majority that we are now second class citizens and less important than the Welsh speaking minority. At railway stations, commuters have to endure long, rambling pre-recorded announcements by Transport for Wales in Welsh first, and English second, in which they tell us how wonderful the rail service will be in five years’ time (‘believe it when it happens’ is my advice!). Democracy played no part in this. It was not a Welsh Labour party policy at the last Assembly elections. There was no public consultation. It just ‘happened’, with minimal media coverage or publicity. The document was published by the Crachach-controlled civil service, and it was rolled out from there. Road safety and the swift communication of information when travelling at high speed now comes a distant second to appeasing the Crachach and Welsh language campaigners. Huw Thomas says he has renounced the Welsh language extremism of his youth, but upon becoming leader of Cardiff Council in 2017, a policy was rolled out of ‘Welsh first’ in official council correspondence. The 2011 Census showed that 84.25% of Cardiffians have no knowledge of Welsh, and 89.25% of the city’s population were unable to speak Welsh, yet Welsh is now the first language on official council emails. Why? Who authorised this? Who benefits from it? It’s just another subtle way of letting the non-Welsh speaking vast majority know they are now second class citizens. By making the ability to speak Welsh a requirement for an ever-increasing number of public sector jobs, the council is excluding the most suitable candidates for the jobs, in favour if candidates who may be of inferior ability in all other respects, but have the ability to speak Welsh. This inevitably has an impact on the quality of public services in the city. This is by no means confined to Cardiff, and surveys claiming there is sufficient demand for Welsh language provision should be treated with suspicion. For example, in December 2018, Newport Council created an online survey seeking people’s requirements for school services in English and Welsh. The survey was flawed for much the same reasons as was the case with the petition about Cardiff City stadium announcements. Those filling in the questionnaire were at no time required to provide their names or address so that it could be verified that they lived in the Newport Council area. In other words, there was nothing to prevent Welsh language activists from organising themselves online and distorting the survey for their own agenda. It is not always easy to define where the line is crossed between general Welsh nationalism, Welsh language activism, the Crachach and the darker elements that have been around in various forms for decades. Between 1979 and 1990, Meibion Glyndwr carried out an arson campaign in which there were 228 attacks on English-owned holiday homes. As late as 1993, the organisation gave 19 English families an ultimatum: leave Wales by 1 March or be burned out. It is of course wrong to say that all Welsh nationalists are sympathetic to their agenda, a very large number have no time for them, but someone as high-profile as Gwynfor Evans was tempted voice his support, which led him into conflict with his next-but-one successor as President of Plaid Cymru, the more moderate Dafydd Elis-Thomas, who was unequivocal in his condemnation of them, and refused to consider them Welsh nationalists. Yet there is a blurring of the lines, insofar as there appear to be rather a lot of books and folk songs in Welsh language culture eulogising their efforts. Nowadays, the main Welsh language pressure group is Cymdeithas yr Iaith Gymraeg, who are not involved in anything as dangerous as arson attacks, but are certainly not immune to committing acts of vandalism and thuggery, such as the 2001 spraying of graffiti on shops in Cardiff city centre, or the 2011 break in and trashing of the constituency office of prominent Welsh Conservative Party politicians Jonathan Evans MP and Jonathan Morgan AM. Cymdeithas yr Iaith Gymraeg does appear to have a certain level of support among the Welsh language establishment, and they are frequently reported in a sympathetic way by BBC Wales and others whenever they are looking for a quote on a story about the Welsh language, and prominent Welsh language entertainers such as Geraint Lovgreen have donated money to the organisation. On a lower level, it is clear that there is a significant ongoing problem, especially in parts of North Wales, of hatred, abuse and insults being aimed at non-Welsh speakers. This chart, which came following a Freedom of Information request to North Wales Police, gives a comparison of the number of such incidents aimed at Welsh speakers and English speakers from 2005 until March 2016. It is clear that in every single year, the incidents against English speakers by far outweighs those against Welsh speakers, though for some reason, a disproportionally low number of incidents against English speakers were referred to the Crown Prosecution Service. It’s also notable how little we hear about this from BBC Wales or other Crachach-controlled Welsh media outlets. In recent years, this sort of behaviour has extended to social media. It can be found on all the main platforms, but by far the worst is, unsurprisingly, Twitter. It follows a peculiar pattern: Very few of these accounts use their real names or include a profile picture. A tiny number have a sizeable following in the thousands, and those that have a decent number of followers often define their account as an unofficial body combining support for the Wales national football team and Welsh nationalism. Yet beyond this handful of accounts, the vast majority only have a few hundred followers (if that), most are based in West or North West Wales, and all behave in a very similar way. They find a particular ’cause for the day’. That could be broadcaster Jeremy Vine composing a tweet of which they do not approve, Iceland supermarkets refusing to put Welsh language signs in their stores, or Virgin Trains refusing to give Welsh language announcements when West Coast trains briefly cross the border into Wales to stop at Wrexham and Chester. They then bombard the company or individual with threatening, abusive tweets for a day or two, before moving on to their next cause. At best, the behaviour of these anonymous trolls can be described as babyish, or school playground behaviour. Gutter language is banded about freely. Words like ‘English’ are used as casual terms of abuse. At worst, it is extremely menacing, and the content of their tweets could fairly be described as deviant. The fact that such thoughts go through their heads, let alone make it into a tweet, gives cause for concern about their mental state. Mr Vine and others have felt the need to apologise to the mob, wrongly believing that they represent the people of Wales. In reality, the anonymity of almost all of these accounts, combined with the low number of followers and similar use of language strongly suggests that they are an organised mob, rather small in number, but have numerous Twitter accounts, by which, to the untrained eye, their support base may appear far bigger than it actually is. One of their most recent targets has been celebrity chef James Martin. A recent episode of his programme, ‘James Martin’s Great British Adventure’ contained several glaring errors about Welsh geography, but the issue that most seems to have riled the mob is his referral to Wales as a ‘principality’. The International Organisation for Standardisation has defined Wales as a ‘country’ rather than a ‘principality’ since 2011, but Wales is still commonly referred to as a ‘principality’, and Prince Charles is still very much the Prince of Wales. Indeed, former Plaid Cymru leader Dafydd Elis Thomas, currently the Welsh Government’s tourism minister, promotes Wales as ‘a principality within a United Kingdom’. From what I can tell, a lot of these accounts are operated by young males. It may well be the case that they have lived their entire lives within small Welsh-speaking communities in West and North West Wales. This may be clouding their judgement, or may go someway towards explaining the paranoid suspicion they appear to have towards English people, or even non-Welsh speakers in Wales. I have a policy of not engaging with the mob, and would advise others to do the same. There is no point in trying to debate rationally with someone who hides not only behind a keyboard, but also behind a pseudonym and a picture of bacon and eggs, or a cartoon of some obscure Welsh prince from the Middle Ages. A good rule to live by is that if people are not willing to debate with you using their real identity, they are not worthy of your time or attention. One has to ask why the mob resort to such aggression and gutter language? I put it down to them not knowing how to debate sensibly. They live their daily lives entirely among their own small community, and are not used to having their attitudes and opinions challenged. The internet, in particular social media, exposes them to viewpoints they have seldom encountered before. They have also had 40 years of successive governments giving them more and more of what they want, so are not accustomed to having to explain why they hold the views they do. I very much doubt many of the mob are interested in listening to advice from me, but to those that are, I suggest they take steps to broaden their horizons. Paranoia and fear of ‘the other’ appears to be widespread in their communities. My advice? Go and spend a few years at a university in England. If you are not academically-minded, move to a town or city in England for six months, live in a cheap bedsit, and get a job in a bar or a restaurant. You will be mixing with English people day in and day out. You will soon realise that these people are not a different species – there are good and bad people everywhere you go in life, and it’s certainly not the case that people from England are involved in some bizarre plot to suppress Wales or undermine the Welsh language. England is not ‘out to get’ you, and English people are not involved in some grand conspiracy against you. Hatred of English people is moronic and irrational. Even if you choose to return to your towns and villages in Wales after a period away, you will do so greatly enriched and with much broader horizons as a result of your experience. One of the major changes that has taken place during my lifetime has been the dogmatic imposition of the Welsh language on schoolchildren in areas where there is no modern history of the language being widely used, and little evidence of parental demand for Welsh language education. I attended Holy Family Primary School in Pentrebane, Cardiff, between 1988 and 1995. Until around the time of the Welsh Language Act 1993, I barely heard a word of Welsh at school. Parents who wanted their children to be taught in Welsh could send them to a Welsh language primary school a short walk away. Parents had the freedom to choose the language in which their children were educated, which, in my view, is how it should be. I recall on one afternoon, the older classes were taken into the school hall to learn the national anthem. It succeeded (I can sing it word-perfectly), but we were taught ways of remembering it that some may consider crude and unsuitable, for example, ‘mae hen’ became ‘my hen’. Even at the age of 11, I could tell that all this was essentially a box-ticking exercise. It wasn’t a meaningful gateway to the Welsh language or Welsh language culture. From 1995-2000, I attended Corpus Christi High School, where Welsh was a compulsory subject until the end of year 9. For the first year, I ‘got by’, but in year 8, with the same teacher, I really struggled. Then, in year 9, something extraordinary happened, which I still can’t quite understand. I was in a much smaller class of about 12 pupils, with a different teacher. Welsh lessons became fun and a good laugh. I quickly made enormous progress, and it wasn’t long before I was near the top of the class. And that marked the end of me learning Welsh. In the years since, further top-down measures to impose the Welsh language upon the education system have been introduced by the Welsh Government, under pressure from the Crachach in the civil service and elsewhere. In July 2017, Educations Minister Kirsty Williams (who is, in theory, a Liberal Democrat) introduced a strategy aimed at creating a million Welsh speakers by 2050. No great effort has been made to explain what the advantages will be of doing this, nor has the strategy been properly costed, probably for fear that it would lead voters to conclude that the money could be better spent on improving our public services and creaking infrastructure. This was followed in January 2019 by an announcement that from 2022, all pupils will follow the same curriculum for the Welsh language, but English-medium pupils will not necessarily be expected to meet the same standard as Welsh-medium students. The Welsh Government has announced that there will be an intensive training programme for primary school teachers in particular, to ensure they have the required skill, but once again, they haven’t reviewed how much it would cost, how much time it will take, whether the aim is realistic (it almost certainly is not) nor have they explained what the tangible benefits of this measure will be. A number of local councils have claimed that there is increasing demand for Welsh language education in their areas, and have created new schools to meet this. We have already seen how these ‘surveys’ can be skewed (such as the above example with Newport Council), but that aside, it is very often difficult to obtain accurate data on how they reached these conclusions. Freedom of Information requests are often met with responses along the lines of how they do not have specific data, which is often followed by a platitude about their ‘commitment to bilingualism’. Ireland appears to have its own version of the Crachach. Replace the word ‘Irish’ for ‘Welsh’ in that package, and every single word would ring true for the situation in Wales. Butler offers an interesting solution, by comparing it to the revival and modern-day popularity of the Gaelic games. For 70 years the GAA had a closed, defensive mentality. Its members were banned, not just from playing, but from even attending soccer or rugby matches. Back then, the GAA didn’t have the confidence to believe that their games could survive in open competition with other sports. Archive footage from that time shows that Gaelic games were pretty unsophisticated. Today, the ban is long gone, and GAA players are elite athletes. GAA, with minimal state involvement and zero compulsion, has never been more popular. GAA was once a minority interest, the way the Irish language is now. If children were encouraged to embrace the language, the way they do the sport, not out of duty or obligation, but out of genuine affection, the Irish language could thrive. The same applies to Welsh. Growth happens by consent, not compulsion or imposition. A likely explanation for the decline in the Welsh language in the decade to 2011 is one based on economics. A lack of jobs opportunities in West and North West Wales is resulting in Welsh-speaking young people permanently leaving the area, often to English-speaking parts of Wales or to England itself, and English inevitably becomes the main language with which they lead their lives. It is right and proper that we acknowledge that it is important to some parents in some parts of Wales that their children are educated primarily through the medium of Welsh. We should respect that and ensure that sufficient school places and resources are made available to them. But many other parents have very different priorities, particularly in areas of Wales where the Welsh language has not been widely spoken for many generations. Many of these parents consider it essential that their children are educated primarily in the English language. They consider the English language to be a tremendous gift, and one that will open doors for their children in the ever-more-global jobs market they will be entering. Not only is English the language of the family home and local community, it is the international language of business, and of the internet, and of science and technology. Yes, it is true that Welsh language schools also teach English as well, but English is a complex language that is best mastered through frequent, daily use. In my experience in the workplace and elsewhere, people who were educated in Welsh often have difficulties with English grammar and comprehension, with a tendency to spell words phonetically. One frequent example I’ve encountered is when the Welsh nationalist bullies look to throw a cheap insult at me on social media, they frequently use my lack of hair as a target (something I couldn’t care less about), but they often use the word ‘bold’ instead of ‘bald’. Parents who wish for their children to be taught in English very often consider it important that their children have the opportunities to learn foreign languages, which will open doors to them in the global jobs market, such as Mandarin, spoken by 1.2 billion, Spanish, spoken by 437 million, French, spoken by 220 million, German, spoken by 95 million, or Russian, spoken by 166 million. By contrast, Welsh is spoken by around 600,000 people (at a most generous estimate) in Wales (almost all of whom can speak English), and by below 5,000 people in Patagonia, and, erm, nowhere else. The Welsh language, not part of their family or community culture, will not enable them to communicate with millions of people around the world. Modern languages will. The sole advantage of learning Welsh is that it will enable them to apply for an ever-increasing number of public sector and media jobs in Wales where there is a Welsh language requirement, not due to public demand, but to fulfil a political dogma. Proponents of Welsh language education often argue that it is not a case of ‘either/or’ and that children can learn both Welsh and foreign languages. Indeed they can, but there are a limited number of hours in a school day and something has to ‘give’ in the timetable to accommodate Welsh lessons. In my case, I would have needed to drop French or Spanish to accommodate Welsh, which would have limited my ability to communicate with a vast section of the global population. To put it bluntly, many parents in English-speaking parts of Wales regard every hour their child is forced to spend learning Welsh as an hour that could be better spent learning a language vast numbers of people actually speak in the wider world. We should also not overlook the reality of Welsh medium schools under-performing in terms of English and foreign language academic attainment. According to the international PISA rankings, exam results in Wales are lagging behind those of all other UK nations. Since 2011, the percentage of Welsh medium teachers going into secondary education who have a degree in Welsh is 38%, the highest percentage of any subject for an initial degree. By comparison, just 2% have a degree in English. In Welsh language schools, English results suffer and modern foreign language teaching is reduced. Gwynedd has 13 Welsh language secondary schools and just one English. just 10% of pupils entered a modern foreign language GCSE in 2018. Gwynedd has the worst GCSE results in the whole of Wales. Only ONE school achieved above the national average – yep, you’ve guessed it, the English language secondary school. The worst school in Wales was Ysgol y Berwyn in Bala, where just 23% of pupils reached level 2 in English. This Freedom of Information request reveals just how truly appalling Welsh medium GCSE English results were in 2018. Parents who choose to send their children to Welsh medium schools should do so with an understanding of how they could hinder their child’s ability to speak, write and comprehend English. The complete results for every school in Wales are available via this FOI request here. Wales needs to have an honest conversation with itself. Many people know and understand what the problems are, and of the influence the Crachach has over public life in Wales, but choose to remain silent, for fear of it affecting their jobs. The Welsh economy is hugely reliant on the public sector for employment. Many other people work for third sector bodies, who are dependant on the benevolence of the public sector for their continuation. For these reasons, many people are reluctant to ‘bite the hand that feeds them’. This is entirely understandable, but it comes at a cost. No man is an island. He (or indeed she) may choose not to rock the boat, but, for example, when his child is forced to attend an under-performing school, there is a price to be paid for his silence. When that child becomes older, and is excluded from vast sections of the jobs market due to Welsh language imposition, wider society suffers. We have now reached a stage where remaining silent is no longer a luxury we can afford. Wales requires huge subsidies from elsewhere to sustain its standard of living. This comes in many forms, including the Barnett formula and EU grants. The United Kingdom is a net contributor to the EU, however, Wales is a net beneficiary. Post-Brexit, many of the EU grants that come to Wales will be replaced by subsidies from the English taxpayer. This will leave the English taxpayer in a position of being made to subsidise Wales, but having no democratic say in the composition of the Assembly, who have power over devolved matters. This is constitutionally dangerous and risks becoming the source of increased friction between England and Wales. At our best, we the people of Wales, are people of great imagination, creativity, wit and ambition. But we cannot fulfil our potential for as long as a small, self-serving Crachach elite are using the Welsh language as a weapon with which to ostracise vast swathes of the population and consolidate their own narrow self-interest. IT HELPED ease the financial hardships of the working classes in the pre and post-war years, evolved into the beverage of choice for an iconic motor racing champion in the 1970s, and morphed into a cool, hip, even middle class brand in the 1980s, but Brooke Bond Dividend, latterly known as Brooke Bond D, died a quiet death at the age of 83 earlier this year, almost entirely unnoticed. Brooke Bond Dividend Tea launched in 1935 as the company’s value product to compliment the mid-market PG Tips, which it began producing five years earlier from its factory at Trafford Park near Manchester. Each packet contained a picture card and a cut-out stamp, with 60 needed to fill a book that could be redeemed for cash or gifts. For many years, a full book of 60 stamps could be exchanged for 5/- cash or groceries from retailers. An early billboard campaign featured a drawing of a young married couple with the slogan ‘Spend Wisely, Save Wisely’. The blend of the nation’s favourite beverage and an incentive to save money proved a hit with the working classes. The same year, ‘The Brooke Bond Programmes’ aired on Radio Luxemburg (1293m) and Radio Normandy (274m) six mornings per week. But storm clouds were gathering for dividend stamp collectors with the outbreak of World War II in September that year, and when rationing was introduced in 1940, the book-filling process was slowed down for millions as tea was restricted to 2oz per adult, per week. Tea rations gradually increased in the years after the war ended and had reached the pre-war consumption level of 3oz per head some time before restrictions were lifted on 3 October 1952. The same year, Gerald Brooke, son of company founder Arthur, retired as chairman, under whose tenure the company’s tea packet trade had multiplied 20 times, helped in large part by Brooke Bond Dividend’s reputation for striking a balance between affordability while maintaining quality with a blend of 30 teas. Gerald was succeeded by high-powered, resilient son John, and company turnover exceeded £68 million in 1954, with the majority of sales coming from quarter pound packets of tea, of which one thousand million were sold globally throughout the year, and three years later, the company was probably the largest in the world, with a one third share in both the British and Indian tea markets. These were the boom times for Brooke Bond. In 1958, the company’s head office moved to Cannon Street, London, and by 1963, the company owned 30,000 acres of tea plantations in India, Ceylon (Sri Lanka) and Africa, employing 50,000 people. The humble tea bag was created by accident in 1908, when New York tea merchant Thomas Sullivan began shipping Indian and Chinese tea to his customers in small silk sample packages. Assuming they were supposed to submerge the entire bag into boiling water, his customers unintentionally revolutionised tea drinking for at least the next 100 years, and in the 1920s the fabric was changed to gauze, though it took until 1953 before Tetley, one of Brooke Bond’s biggest rivals, brought the concept to Britain. To begin with, tea bags were regarded as a gimmick by most in the industry and Brooke Bond resisted the temptation to follow their rivals until well into the 1960s, when it became clear that the concept was here to stay as consumers became used to the convenience. The company went from strength to strength, and in 1968 it merged with Liebig, owners of food brands including Oxo and Fray Bentos. 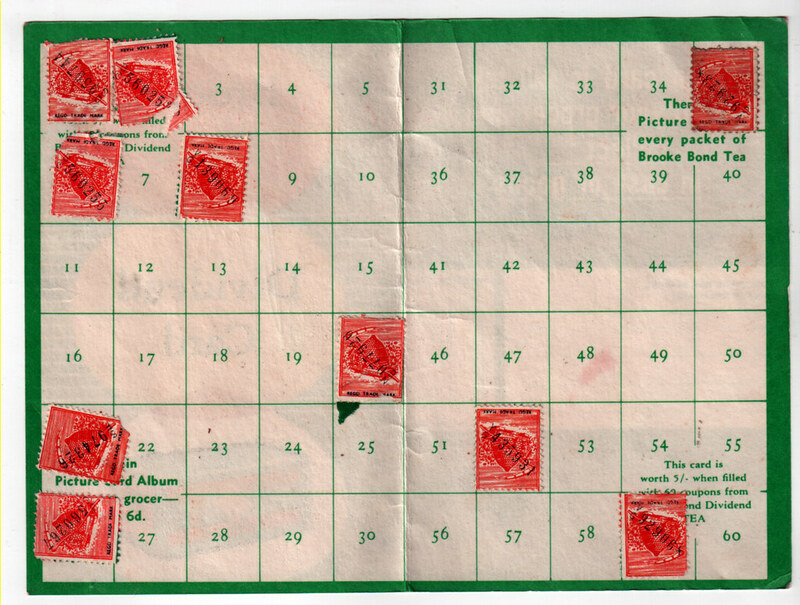 When Britain ‘went decimal’ in February 1971, a completed card of 60 dividend stamps could be exchanged for 25p in cash or groceries at stores that sold Brooke Bond D. Twelve months later, Brooke Bond’s share of the British tea market had grown to 40%. The midmarket PG Tips was brand leader with 20%, while Dividend held a respectable 12%. 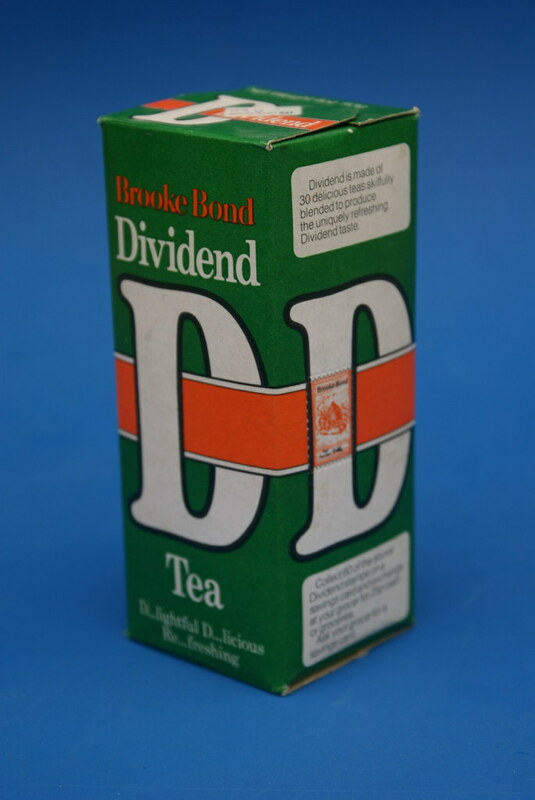 Dividend tea remained popular throughout the 1970s, but Brooke Bond showed signs of evolving the concept, as by the middle of the decade a giant ‘D’ covered most of the packaging, with the word ‘dividend’ reduced to smaller lettering near the top. The brand’s prominence was maintained by regular newspaper and TV adverts, including one featuring Formula One world champion Jackie Stewart and his wife Helen based around the Herbert and Sullivan song ‘A Nice Cup of Tea’. As the 1970s gave way to the more aggressively capitalist world of the 1980s, the dividend stamp scheme came to an end and the tea was rebranded ‘Brooke Bond D’, though it remained instantly recognisable as the ‘D’ had been prominent on the packaging for some years. Throughout the 1980s, attempts were made to move the brand’s image away from its downmarket, ‘scrimp and save’ image and give it a cooler edge. 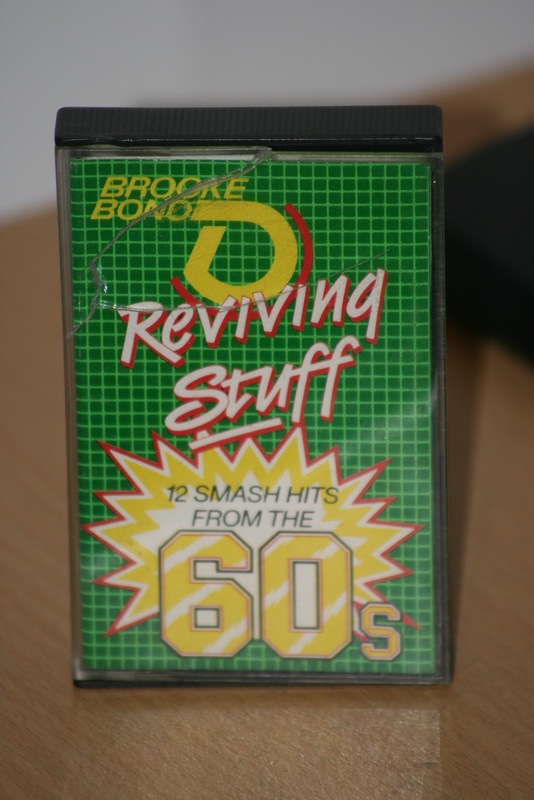 Brand loyalty was maintained with incentives such as the ‘Brooke Bond D – Reviving Stuff’ series of cassette tapes featuring classic chart hits, which could be redeemed for coupons on the back of packets, and in the first half of the decade, blocky computer graphics were used in its TV advertising campaign with the strapline ‘The Tea With the 3D Taste’. Brooke Bond Liebig was subject to a hostile takeover by multinational giants Unilever in 1984, and two years later, Brooke Bond D’s longest-running and best-remembered advertising campaign began with soul singer Madeline Bell providing the vocals to ‘I Could Do with a D’, which had varying lyrics to fit the accompanying pictures, penned by the late Ronnie Bond. A non-PC advert from 1986 featured ‘Only Fools and Horses’ actor John Challis (well, it looks like him – what do you think?) playing the boss of a glamorous young yuppy who uses a typewriter to inflict an injury on him when he touches her knee. An early 1990s version saw actress Jane Cunliffe as an ever-busy ‘mumsy’ figure to a family with young children, with new lyrics to accompany the by-then familiar tune. There was also a ‘How Many Ds in Match of the Day?’ advert that aired around this period. But the 1990s heralded the beginning of the end for Brooke Bond D. It lived on for another two decades, but its very gradual demise and fade from the public view was underway. The TV adverts came to a permanent end in the middle of the decade, and its presence on supermarket shelves reduced with every year that passed. The brand was no longer one of Unilever’s priorities, so the licence to produce Brooke Bond D and the upmarket Brooke Bond Choicest Blend was sold to Gold Crown Foods Ltd, who produced rival brand Typhoo in neighbouring rival Merseyside. The company (now trading as Typhoo Tea Ltd) removed the words ‘Brooke Bond’ from the packaging, which otherwise remained identical, with a green box and a bright yellow ‘D’ on the front, and a picture of an early 1990s family sat around a kitchen table, complete with tea pot and teenage boy with a ‘mop top’ haircut. The Brooke Bond brand quietly disappeared from the UK, but it lives on in other countries, including Pakistan, where ‘Brooke Bond Supreme’ is the market leader. During the 2000s and into the 2010s, D Tea, while consistent in taste and familiar in appearance, was increasingly regarded as a ‘budget’ tea, sold mainly in local convenience stores and in pound shops, usually in a ‘50% extra free’ box with 120 bags for the price of 80. Perhaps this was, in a sense, a return to its ‘dividend’ roots and a ‘tea of the people’. Typhoo ceased production in 2011, but this wasn’t the end of the story, as discount retailers buy huge quantities of staple products years in advance, meaning D Tea remained a regular presence on the shelves, as well as being sold on Typhoo’s own website, and by a number of independent retailers on Amazon. The death knell finally sounded in August this year with the demise of Poundworld, which was the last major retailer with reserve supplies of D Tea. We are now a country that drinks twice as much coffee as tea. The humble tea bag won’t be disappearing from the shelves any time soon, but it is forced to compete for space alongside herbal, green and an ever-expanding range of flavoured counterparts. D Tea was unable to define its purpose on the shelves of 21st century Britain where a no frills cup of tea is no longer the nation’s default drink, and where dividend stamps and collector’s coupons have given way to loyalty cards and online discount codes. I read with interest an article on Peter Hitchens’s blog in which he details a recent visit to Liverpool to debate what he rightly describes as a non-existent ‘war on drugs’. Mr Hitchens, a Mail on Sunday columnist and a skilled, passionate debater, was invited to the University of Liverpool by Tom Willett of the Politics Society, but in accepting the invitation he would have been obliged to agree to the provisions in the university’s policy and code of practice regarding freedom of speech, and the Guild of Students’ (just a pretentious name for the students’ union) equality and diversity policy, which, evidently, put significant constraints on freedom of speech and stand in the way of rigorous, robust debate. Undeterred, Willett, to his credit, risked his own money by hiring a private hall which was not part of the university. But when the caretaker failed to turn up, Willett and Hitchens decided to hold the meeting outdoors on an open hilltop area in Hope St, which links the city’s Roman Catholic and Anglican cathedrals. As the article suggests, it turned out to be a positive experience, with a more alert audience and sharper questioning than had the debate taken place in a stuffy room. This brought back vivid memories of a time, nearly 15 years ago, when I tried, and regrettably failed, to get Mr Hitchens to debate a different issue at the same university, but was blocked on similar grounds to those Willett experienced. It is important to put the story I am about to tell into some kind of context. The world has changed considerably in the 15 years since it happened. You are about to be taken back to a world where Anthony Blair was still at the height of his popularity, and almost all university lecturers and most students were still more-or-less in love with him (though NOT me). The Iraq War had not yet happened. Anyone seriously proposing that gay and lesbian people should be allowed to marry would have been considered eccentric. Facebook, Twitter and YouTube did not exist. Mobile phones were used only for calls and texts, which were expensive. Phone calls to family and friends back home were strictly rationed and conversations abrupt and to-the-point. Keeping in touch with friends from your home town, or even with those who had moved to different halls, required a degree of effort on both sides. WhatsApp and Facetime were still many years away. The main means of free, instant communication was MSN Instant Messenger, and even that was blocked on university computers. The internet was far less developed. Broadband was still unavailable in many parts of the country, and even if you did have access to it, ONE Mb was the standard speed. DVDs were increasingly common, though many people, myself included, still preferred to use videotape. Most people still listened to music via CDs or cassettes. Radio was listened to on FM, MW and LW (I am aware many teenagers will not even be familiar with these terms). I was considered quite ‘cutting edge’ when I bought a Freeview box for the TV in my bedroom, pretty soon after it launched at the end of October 2002. Coffee culture did not exist. Gassy lagers and alcopops were the drinks of choice for students. The majority smoked cigarettes, a packet of which cost around half their price in 2017, and it was perfectly acceptable to smoke in pubs, bars and cafes. At the University of Liverpool, the Sydney Jones Library (the main library for arts and humanities) was outdated, dingy and badly in need of investment. Most of the lecture halls and seminar rooms hadn’t been updated since the 1970s. Some students did not pay tuition fees at all. None paid more than £3,000 per year. University itself was cheaper, and student expectations were lower than today. Some lecturers and tutors barely hid their view that teaching was an irritating but necessary distraction from the research work they’d rather be doing. The students union (rather pretentiously called the Guild of Students), was easily the least impressive of any students’ union building I’ve ever been in. The meeting rooms all had paint peeling from the walls. The smell of damp was everywhere. It was stuck in a 1970s time warp, large sections of it lay semi-abandoned, the food was nothing to write home about, and the cloths on the pool tables were bald. The main hall was turned into a night club on Saturday and Monday nights. There were occasional nights of comedy, drama and concerts, but it was often a rather quiet building during the daytime, with two small bars, a tiny cafe, a shop selling newspapers and snacks, and not much else to see. There was never much sense of ‘community’ about the place. Liverpool itself was also a very different place. It was still suffering a sort of hangover from the Derek Hatton years of the 1980s and the decline of the docks. The city was packed with remarkable and beautiful architecture, but it was dirty and unloved, with many splendid buildings boarded up and abandoned. The legendary Cream nightclub had closed for good a few months before my arrival. The bars of Concert Square and a shabby club called ‘The Krazyhouse’ seemed to be the venues of choice for students. I noticed a very gradual revival in the city’s fortunes in the months leading up to my departure in the summer of 2005, but the main regeneration came about around the time of the city’s year as European Capital of Culture in 2008, which saw the construction of Liverpool One shopping precinct, a large concert arena and a major revamping of the area around the Albert Dock. I cannot say I can relate to Mr Hitchens’s experience of Hope St. In my three years there, it contained two theatres, the Philharmonic (where my graduation ceremony took place in 2005) and the more ‘alternative’ Everyman, which was looking outdated but contained a rather good underground bar. There was a bar containing big screens showing sports which appealed to students, but there wasn’t a huge amount in the way of places to eat and drink around there, aside from the takeaway outlets on the adjacent streets leading towards the city centre. From memory, the Philharmonic Dining Rooms didn’t have the impressive façade of today, and it operated primarily as a hotel. It never occurred to me to go in there, but having seen pictures of the spectacular interior, I very much hope to enjoy a meal and a few beers in there some day. The street lighting gave off a dim, orange glow and it was advisable to keep your wits about you if walking around there at night, particularly as you got closer to the Catholic cathedral and the area around Brownlow Hill, which had a reputation for prostitution and drug dealing. I agree with Mr Hitchens that there is some interesting Georgian and Edwardian architecture in and around Hope St, especially at the end nearest to the Anglican cathedral, but a quick look on Google Maps proves beyond doubt that he would’ve been able to eat and drink far better than if my proposed debate had taken place 15 years ago, and I can’t say that holding a debate on drugs in the open air around the ‘Case History’ sculpture would’ve been particularly feasible or safe back then. There were probably worse places to be a student, but I strongly suspect those attending the university today have a far greater variety of things to see and do. This context is important because, although 15 years may not feel like a long time in the grand scheme of things, for the students of today, the world would have felt like a very different place. In the story below, I cite several examples of people taking days, if not longer, to reply to emails. Back then, this was not unusual. It was not possible to access emails via your mobile phone. You required a computer with a wired internet connection to do so, and it was therefore quite normal for many days to pass between people checking their email accounts. The story began on the morning of Monday 9 December 2002, when I, as a first year student of Politics and Communication Studies, having recently turned 19, attended a politics seminar under the tutelage of Chris Lenton, now a city councillor, and a prominent member of the Liberal Party, a small party founded in 1989 by members of the original Liberal Party opposed to its merger with the Social Democratic Party to form the Liberal Democrats. The reformed Liberal Party, which is Eurosceptic, has never had much success nationally but has maintained a significant presence at local council level in Liverpool. At that time, Mr Hitchens was still a supporter of the Conservative Party, albeit not a very enthusiastic one, and held the view that a person could not be a conservative if they were openly gay, and that comprehensive education had played its part in brainwashing a generation into accepting Mr Duncan’s standpoint. Hitchens’s view was that while he believed homosexuality should be legal, it was not moral, and that if Mr Duncan had kept his sexuality private, it would have been his own business, but by making it public, he could not legitimately call himself a conservative. In the seminar, Lenton remarked that he did not think Mr Hitchens truly believed the things he wrote, and a number of the dozen-or-so students present nodded in agreement. I kept quiet – I had had a small number of dealings with Mr Hitchens via email in the previous few years, and did not doubt for one second that he absolutely believed the things he wrote. As soon as the seminar ended, I headed straight for the IT room so I could email Mr Hitchens to tell him what happened. Two days later, he generously replied that he would be willing to come up to the university and debate the issues raised, under a fair chairman. His only requests were for somewhere clean and quiet to stay, and for his expenses to be paid. Unlike Tom Willett, I did not have the backing of the Politics Society, of which I was not a member (I saw enough politics in my course and in my non-university related activities), so I was very much a ‘lone wolf’ in this venture. I wasted no time in contacting Lenton, who responded by saying it would be a great idea to bring Mr Hitchens to the university, and suggested Cllr Steve Radford as an opponent, who is today the leader of the Liberal Party. I was delighted and proceeded to get the wheels in motion. However, the university was by now winding down for the Christmas break. Most of January would be taken up with examinations and ‘student life’ would not really resume its normal pace until late January or early February. At some point soon after ‘student life’ resumed in 2003, I sussed that to make the debate happen, it would be a good idea to get support from the homosexual community at the university. The LGBT society (just the four letters in those days, or maybe even three – my records show it was called the ‘GLB’ society, though that may be an error on my part), had a small office in the Guild of Students. I knocked on the LGBT office door with a copy of the newspaper article in my hand, and passed it over to one of the small number of people present, and can clearly remember saying, slightly tongue-in-cheek, “Are you as angry as I want you to be?” The young man replied ‘yes’, and all those present said they would support me in my bid to get Mr Hitchens to come to the university. My email records show that the next significant activity came on 14 March, when Anne Fuell, the General Secretary of the Guild of Students agreed to help publicise the debate. I then emailed Mr Hitchens to see when he was available in late March or early April, with a view to holding it before the Easter holiday. I am relying on email archives from that time to piece together the exact order in which events unfolded after this, so minor details in chronology may be incorrect. Incidentally, I find it interesting how little the process of composing and sending an email has changed in the last 20 years. The main innovation being that higher upload and download speeds mean it is far easier to send and open attachments than it was even 10 years ago. utmost to get everybody elses. like the chance to attend and challenge his homophobic views. understand why we cannot host the event. I emailed Mr Hitchens immediately. This had become a matter of principle for both of us. The following day, he replied, suggesting that I take the matter to the student newspaper. I did so, pretty much straight away, though the university’s Easter holiday was now imminent and we would return towards the end of April for a few more weeks of teaching, followed by a period of examinations, after which the university would shut down until late September. On 21 May 2003, I emailed Mr Hitchens to tell him that I had not yet received a reply from the paper’s editor after all these weeks. They could be excused for not replying during the Easter vacation, though this had ended a week or two earlier so they had ample time to respond. Mr Hitchens suggested I pay a personal visit to the editor, as an email can be easily ignored, and nobody would know whether it was indolence or rudeness. I then came up against another obstacle when the student newspaper abruptly closed down. The publication was a joint effort between the city’s three universities – The University of Liverpool, Liverpool John Moores University and Liverpool Hope University. The latter two lost confidence in the newspaper, causing it to collapse and its offices to close. The University of Liverpool announced plans to launch a new paper at the start of the new academic year in September 2003, but until then, there was little I could do. The long summer break followed, and on 6 October 2003, I emailed the editor of the newly-launched student newspaper, who happened to be the very same Anne Fuell who was General Secretary of the Guild of Students in the previous academic year. I had a hunch that her appointment would not be good news for my quest to expose the actions of the student council. She responded by asking for my phone number so she could call me for more details. I provided my number but the phone call never came. i feel it may negatively affect a number of our readers. A few days later, I emailed Mr Hitchens for what would be the last time on this matter, to tell him of this development. He sent me a short reply, in which he said he did not know what else to do, before signing off by saying that this bodes ill for the future of British newspapers. And that is pretty much the end of the story. Fortunately for us all, Anne Fuell did not pursue a career in journalism. Her LinkedIn profile she now works in ‘business marketing’ for London and Partners, the Mayor of London’s official promotions company for the capital. Deborah Lowe went on to work for the BBC in ‘development’, and is now head of development for Wild Blue Media. What conclusions can we reach, and what historic can we learn from this story? First of all, that this is an early example of ‘no platforming’ and ‘safe spaces’ on university campuses. But who were the student council, and indeed the student newspaper trying to protect, and from what? The LGBT society was ready to welcome Mr Hitchens to the university to debate the issue. They did not stand in the way of the debate taking place. Others felt the need to protect them on their behalf. And did those running the student newspaper not understand that it was their duty to inform their readers of the stance the student council had taken? I admit to being shocked at the time by this curtailment of free speech on campus. My Eurosceptic views were firmly established by the time of my arrival at university, and I was undoubtedly in a minority among the students in my belief that Britain should leave the European Union. But at no time did any professor or tutor try to prevent me from saying so or stop arguing my case. Many students seemed to regard my anti-EU views as an eccentric curiosity. A tiny number chose not to mix with me outside classrooms and lecture theatres, but none tried to stop me from openly and freely expressing my opinions. That said, I do think there were occasions where I was marked down in essays and examinations for not conforming to the prevailing pro-EU, pro-Blair mindset of the university. But not once did any student feel the need to escape to a ‘safe space’ because of anything I said, nor did any burst into tears and claim I had hurt their feelings. I wonder whether the same could be said if I was a Eurosceptic undergraduate student 15 years later? If Mr Hitchens had called for homosexuals to be killed, or persecuted, then there would have been a case for him to be banned from speaking at the university. But these were not his views. He believed that homosexual acts were immoral, and that by openly declaring yourself as a homosexual, you could not be a Tory. I should point out that I am certain Mr Hitchens would not offer to come and debate the issue today. He says he now regrets ever getting involved in the debate around gay ‘marriage’ and the rights and wrongs of homosexuality, now regarding it as a very small and largely irrelevant sideshow in the story of Britain’s decline. Within just a few years, he had withdrawn his support for the Conservative Party, rightly believing it to have been captured by Blairites and broadly accepting vast swathes of New Labour policies. I warmly congratulate Tom Willett on succeeding where I failed. I am glad Mr Hitchens enjoyed his visit to Liverpool, and yes, I share his view that it’s a pity more people do not go there. All too often, British people go to great lengths to see far away splendours such as the Taj Mahal and the pyramids of Egypt, while neglecting to spend a few hours on a train to visit the equally magnificent Anglican Cathedral in Liverpool or Lincoln Cathedral. Had I been just a year or two older, I would have had the self-confidence, experience and tenacity to keep fighting. Faced with such a situation today, I am in no doubt that I would have done whatever it took to make the debate take place. Within a year or two, I became aware of speakers being refused a platform at universities up and down the country for daring to believe that Britain should not be a member of the European Union, or that radical Islam was a major threat to our Judeo-Christian culture. In students unions, certain opinions are compulsory, and others are impossible to express. The sphere of acceptable opinion becomes more and more narrow with every year that passes, with unpleasant and inaccurate labels like ‘racist’, ‘bigot’ and ‘homophobe’ placed on dissenters. Fifteen years on from my experience, we appear to have bred a generation of university students who all too often believe they have a right to be protected on campus, not just from violence and danger, but from opinions they personally don’t agree with. What will they be like when they enter the workplace, or worse still, the House of Commons? This should be of major concern for all those who cherish and value freedom of speech, thought and conscience. Novice Rowers are All Star Champions! A TEAM of novice rowers defied the odds to become All Star champions at the annual Llandaff Rowing Club Regatta, which raises money for Velindre Cancer Care and Keep Wales Tidy. The Love Dem Oars winning team (L-R): Richard Phipps, Daniel Edwards, Stephen Cleary and Robert Gordon. Last year, Robert Gordon, Daniel Edwards and Stephen Cleary, now all aged 33, formed a team called ‘Love Dem Oars’ and, after just four weeks of training, they were joined by established rower Richard Phipps for the Splash and Dash Men’s Regatta, where they saw off competitors in three races, which included a comfortable victory against a more experienced group of firefighters in the final. The team’s victory made them ineligible to enter the Splash and Dash this year, but they were invited to enter the All Star category where they were pitted against a team of previous winners, and won the best-of-three race series 2-0. As with last year, they were trained by accomplished rowing instructor Arthur Williams, 70, but they only began their preparations five weeks before the regatta. Robert said: “I entered this event a few years ago with other people, and last year I formed a team with my old school friends Stephen and Daniel, because it raises money for good causes and there’s a decent party afterwards at the club. Velindre is a specialist cancer treatment centre located on the perimeter of Cardiff that provides services to more than 1.5 million people across South East Wales and beyond. Each year, the centre treat more than 5,000 new referrals and around 50,000 new outpatients. * £10 could provide a family with a children’s story book to help adults explain their cancer journey to young family members. * £25 could provide a memory box to help children keep memories of their loved ones. * £50 could provide an hour’s complimentary therapy to help patient’s well-being (acupuncture, reiki etc). * £300 could provide a tablet computer for patients to use whilst in hospital. * £10,000 could provide a scalp cooler to help prevent hair loss in patients who receive chemotherapy. Keep Wales Tidy is a charity working across Wales to protect the environment now and for the future. It also provides environmental education, training, business services and environmental solutions across Wales. Robert, Daniel, Stephen, Richard and Arthur would welcome further donations to these two excellent charities. You can donate by clicking here.